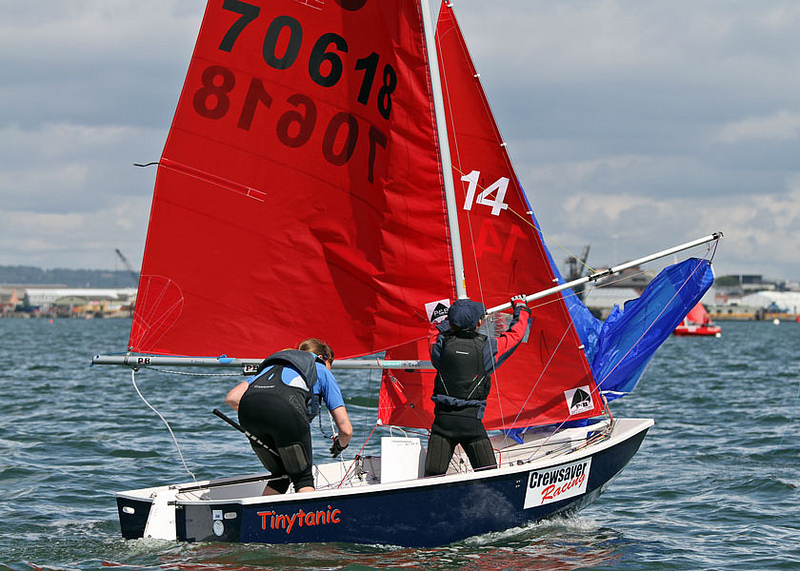 The use of a spinnaker chute on Mirror dinghies is now pretty well universal, and as a result, so is a combined spinnaker halyard & retriver line. 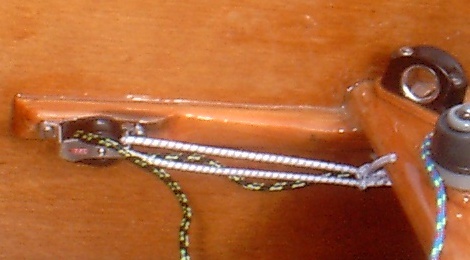 In other words, the halyard starts tied to the head of the spinnaker, goes around a block just above forestay level, back down to a block normally on the stowage bulkhead, back to a cleat near the aft edge of the daggerboard case and then becomes the retriver line, running around a block and into the end of the sock of the spinnaker chute, coming out of the mouth of the chute and ends tied to the retriver patch in the middle of the spinnaker. In my experience it's not worth trying to have the halyard and retriver parts different thicknesses. If you try and do this you end up with a join, and that causes trouble. 3mm diameter dyneema/spectra is just thick enough for a spinnaker halyard and is not too heavy when used as a retriver line, so just go for about 12 metres as per our Running Rigging Specification. Although the general halyard arrangement is pretty standard (described above), there are variations, so I'll now go through things in some detail. The block just above forestay level. On all Bermuda masts (apart from the Trident-UK one ), the halyards run inside the mast, so this block is a sheve box. For some reason, Bermuda masts don't tend to have spinnaker cranes fitted (it's a race legal fitting, but nobody seems to bother). On a Gunter mast the halyards are external and the use of a spinnaker halyard crane is very common, see the article on fitting out a Gunter Mast for details of common spinnaker cranes which is where this block is fitted. On a Trident-UK Bermuda mast, the halyard is external and this block is fitted with a "stand up" spring. 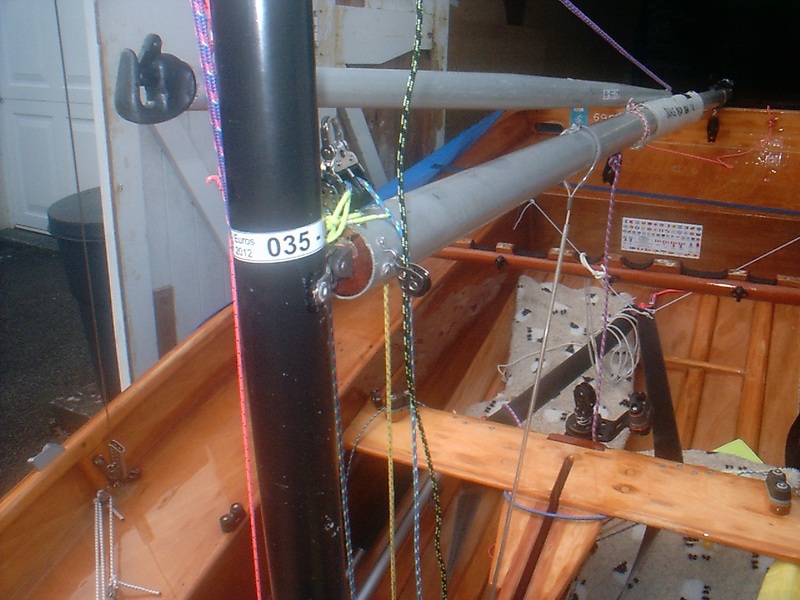 If the halyard runs inside the mast, it normally emerges via a slot below the gooseneck. On the Superspars this is on the starboard side, on a Needlespar this is on the port side. I don't know about other makes. 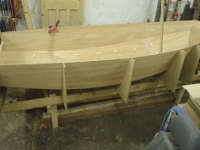 It probably makes sense for the position of this slot to determine which side of the centreline the turning block is on and which side of the daggerboard case the halyard runs. 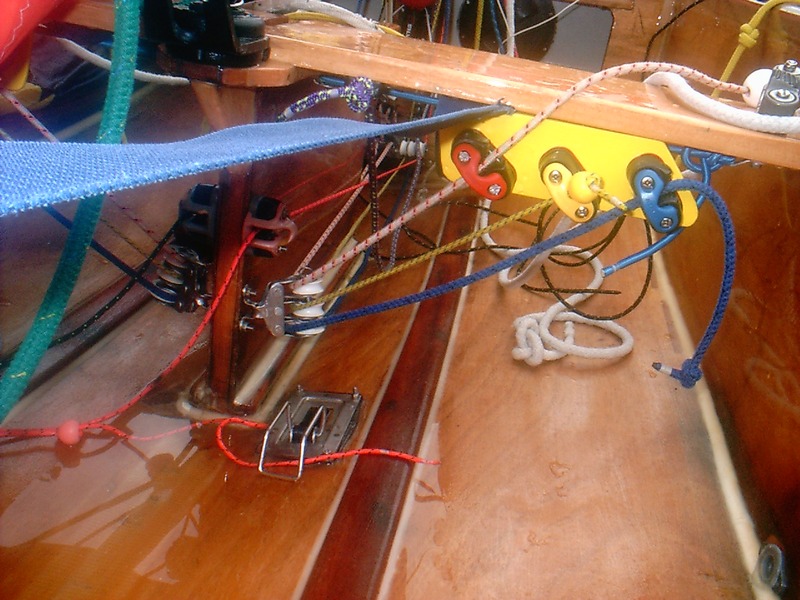 The aim is to reduce friction by allowing the halyard to run a path with minimal rubbing. If the halyard is external, I perfer to run it down the port side of the mast (same side as the spinnaker chute) and the port side of the daggerboard case. 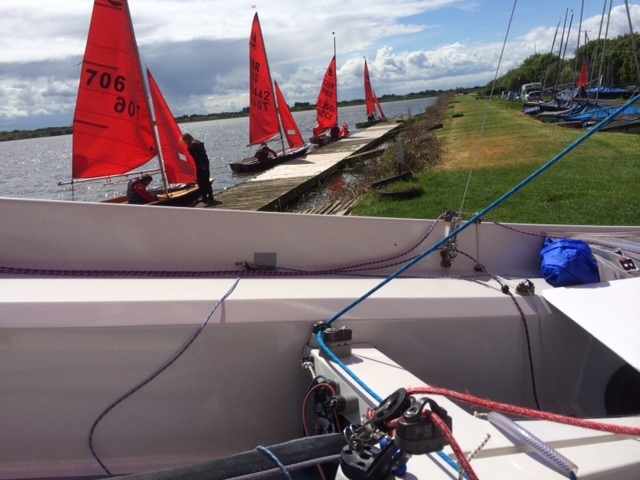 The length of halyard running down to the bulkhead is prone to blow around when not in use and can get fouled around the spinnaker pole eye etc. 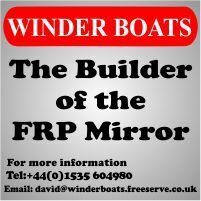 I use a small block fitted to the inboard end of the boom on the port side to help keep the halyard under control and stop it getting fouled up. 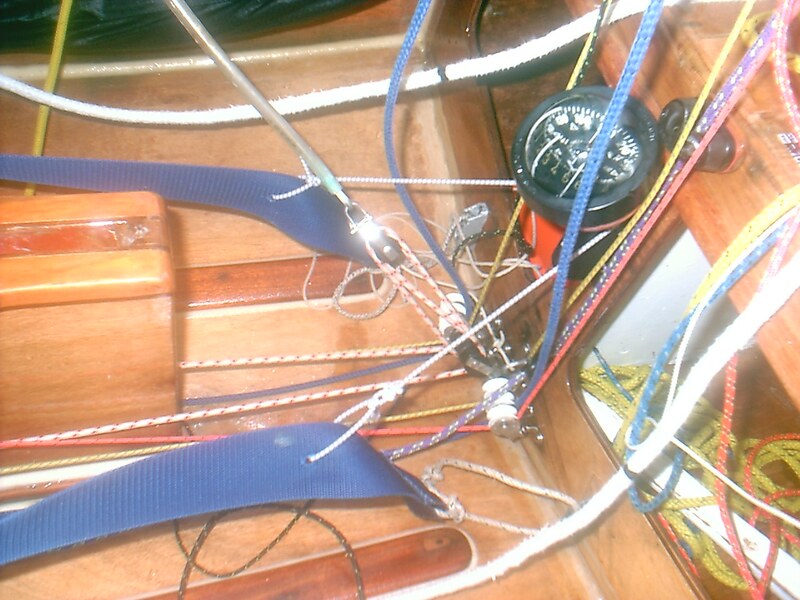 I perfer to have the turning block on the stowage bulkhead as low as possible so that, as far as possible, the halyard is out of the way of the crew. 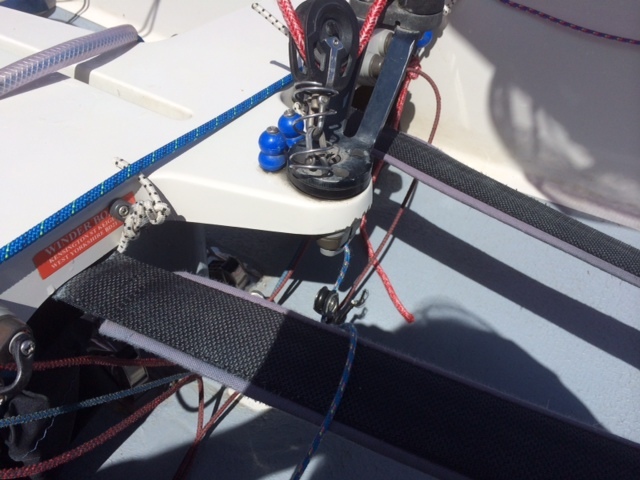 If your block is a single, it's a good idea to have one with a "stand up" spring like this Ronstan RF20141to stop it "capsizing" when there is no tension on the halyard, and then jambing when you try and pull the spinnaker up. 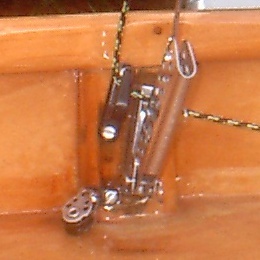 On wooden boats, a cleat mounted on the batten running up the aft edge of the daggerboard case works well. 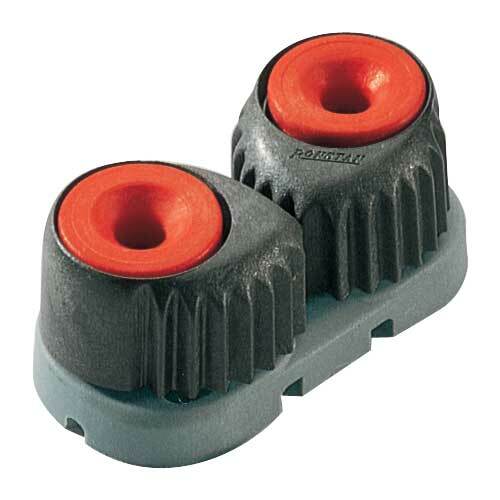 In this case the cleat is a Ronstan RF5001 with a RF5005, which Ronstan describe as a "front" fairlead. 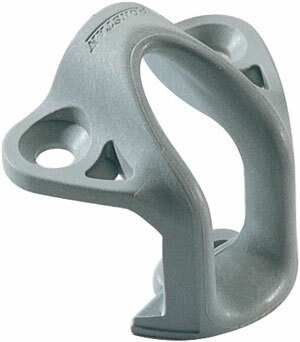 You need some sort of fairlead on the cleat to make it easy to cleat the halyard. 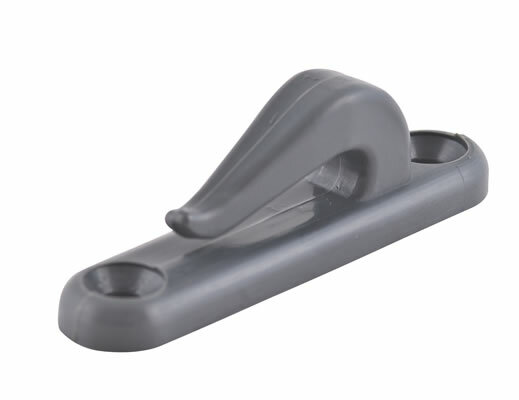 On GRP Winders, the cleat is often mounted under the mainsheet block mounting platform. 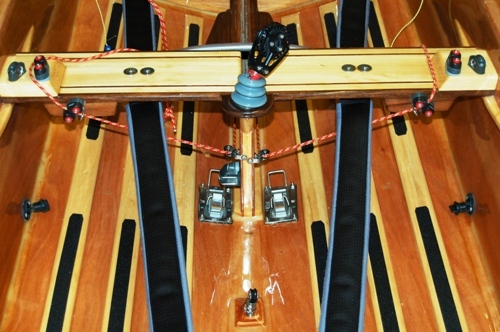 If you decide to mount the cleat upside down like this, for example under the thwart, you need to ensure it is mounted on a shallow wedge and thus correctly angled, or the halyard runs through a fairlead ahead of the cleat, so the halyard does not uncleat itself under tension. Some like to run the halyard around a block fixed to the floor aft of the cleat and designed so the halyard runs through the cleat while it is been hoisted as in this photo of 70606 - All The Right Reasons. The halyard then runs over the top of the toestrap to a block at the end of the spinnaker sock. The location of this block depends on where your sock runs. In this case it's on the thwart support which has been angled so the retriver line runs smoothly with the helm standing to pull down the spinnaker. If your spinnaker sock runs along the sidedeck, the block needs to be fixed to the topsides as on this photo of Winder 70618 - Tinytanic (halyard is thin blue & yellow line). In order to keep all the spinnaker inside a short sock like this, you need to run the retiver line though a plastic ring before attaching it to the retiver patch on the spinnaker. The ring has a length of elastic fixed to it, about the same length as the sock. The other end is fixed near the mouth of the chute. When you pull the spinnaker down, the elastic streaches and the retriver patch and ring come back well past the end of the sock, pulling the head, tack and clew of the spinnaker into the chute. When you let the retriver line go, the elastic pulls the middle of the spinnaker back into the sock as well. One final tip from 1997 World Champion Chris Balding is to have a small lacing hook by the port (i.e. 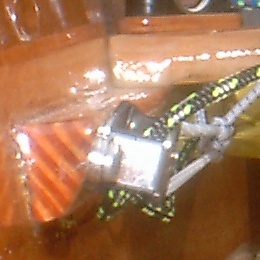 same side as the spinnaker chute) shroud plate with the open part facing upwards or forwards. When the halyard is not in use it is clipped into the hook and the halyard tensioned slightly and cleated. This keeps the halyard out of the way, not getting blown around and not interfering with the jib or the jib tell tales. If you pull the halyard hard it will come out of the clip so you can hoist the spinnaker normally. Most people find the standard clip works fine. 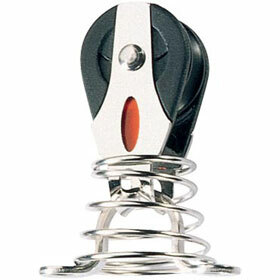 If you find the halyard comes out too easily, you can modify the clip to tighten it up. I drilled a plain non-countersunk hole under the point of the hook, cut the adjacent old fixing hole off and used a pan head screw to reduce the gap for the halyard. A bit of a fiddle, but it worked for me.